'Ghana Beyond Aid' Is The Message Of A Viral Video From President Akufo-Addo : Goats and Soda At a press conference with French President Emmanuel Macron, Ghanaian President Nana Akufo-Addo said the country needs to stand on its own. And social media exploded. 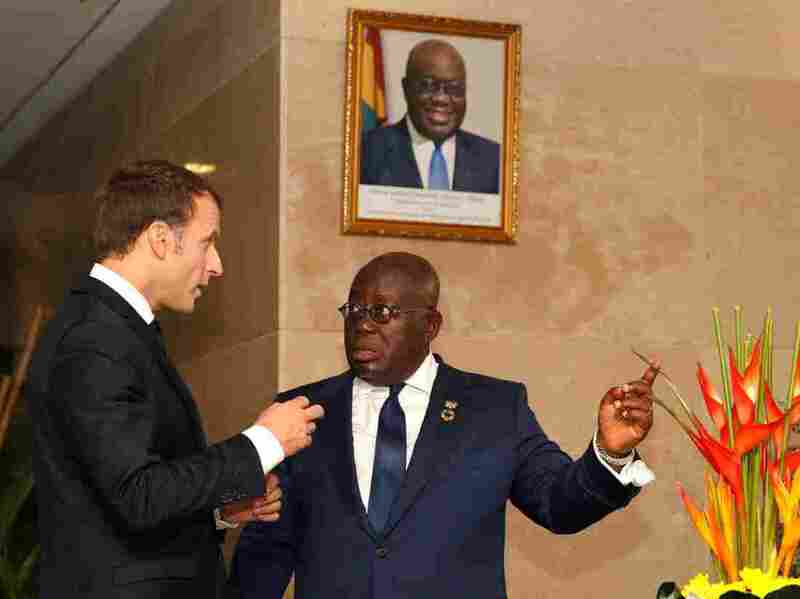 Ghanaian President Nana Akufo-Addo speaks with French President Emmanuel Macron at the presidential palace in Accra. The latest viral video to capture young Africans' social media pages has a striking lack of epic fails or baby animals. It's literally just Ghana's president Nana Akufo-Addo in a joint press conference in Accra with French president Emmanuel Macron, who was making the last stop of his first Africa tour on November 30. Akufo-Addo's response to a journalist's question about French aid has viewers reacting with the "flexed biceps" and "clapping hands" emojis. They're echoing a catchphrase from the early months of his presidency: "Ghana beyond aid." "We want young Africans to stay in Africa," said the Ghanaian president, who took office in January, to a chorus of applause from journalists. "And it means that we have to get away from this mindset of dependence — this mindset about 'What can France do for us?' "
A Ghanaian journalist had asked Macron if France would increase its "support" for African countries that were not former French colonies — like Ghana, which was a British colony until 1957. According to reports, Macron delivered a "fairly standard" response. Then Akufo-Addo answered as well with a preface: "I hope that the comments I am about to make will not offend the questioner too much and some people around here." The question, he said, was based on a false premise. "France will do whatever it needs to do for its own sake, and when those coincide with ours, 'tant mieux' [even better] as the French people say. But our main responsibility as leaders, as citizens, is what we need to do to grow our own countries." "We can no longer continue to make policy for ourselves — in our country, in our region, in our continent — on the basis of whatever support that the Western world or France or the European Union can give us," he added. "It has not worked, and it will not work." Instead, he encouraged African leaders to focus on good governance, accountability and diversity to promote trade. With its wealth of natural resources, the continent should be a donor, not a recipient, he said. It's not surprising that his message of empowerment appears to be resonating across sub-Saharan Africa, which receives nearly 25 percent of official development assistance from OECD countries. The video, which has been shared far and wide on social media, has garnered more than 5 million page views and thousands of comments from popular Facebook pages like Africa Got Talent and Eye Gambia. Among the comments: "Ghana President lecturers France President on western aid policy bent on keeping Africa forever dependent [three "clapping hands" emojis]" wrote one Facebook user. "Ghanaian president spot on, great speech," wrote another. Meanwhile, someone from India chimed in: "The heads of the so called 'under developed countries' should learn from this Hero." "I don't think any country likes to be a recipient of international charity," says Todd Moss, a senior research fellow at the Center for Global Development. "For reasons of self-respect and for reasons of economic prosperity, they all hope they soon will no longer require that kind of assistance." Perhaps Macron's visible uneasiness propelled the video to viral status, but Moss attributes the impact to Ghana's longstanding role as a "bellwether for the rest of the continent." As the first country in sub-Saharan Africa to gain independence, it was also one of the first to experience a period of economic reform in the '80s and political liberalization in the '90s. "Now it sees itself as also providing a signal to the rest of the continent that growth can be led by private investment," ushering in the end of the aid era, according to Moss. Yet many are skeptical that Akufo-Addo is just continuing decades of "hot air platitudes." 1. When he hosted Pres. Emmanuel Macron Of France, Pres. Nana Akufo-Addo Of Ghana loudly said that AFRICA must stop relying on Europe for handouts: Since independence in 1957, Ghana has been playing same “independence “ guitar ad nauseam .. Ghana loves hot air platitudes. Impressive speech, but what are you going to do next? Moss also warned that as "laudable" as it is for countries to want to pull themselves up through private investment, it won't happen overnight. China is eagerly investing in the continent, but "open trade [with the U.S. and Europe] is under direct attack from a number of global powers," Moss says. Joanne Lu is a freelance journalist who covers global poverty and inequity. Her work has appeared in Humanosphere, The Guardian, Global Washington and War is Boring. Follow her on Twitter @joannelu.